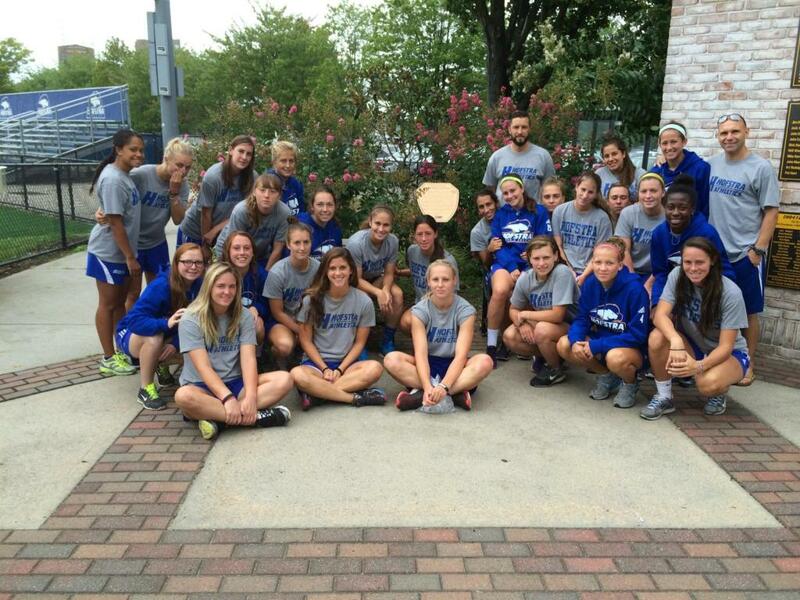 It was a busy day for the Hofstra Soccer Program this past Sunday. The men were playing in the CAA final vs William and Mary after an incredible win in the Semi’s on Friday. Playing a man down, Hofstra scored 2 goals in the final five minutes (game winner on PK with 5 seconds left) to vault themselves into the finals. HU played W & M to a 0-0 first half tie, but once the Tribe scored HU pushed forward allowing a few easy goals to end up with a 4-0 final. Nevertheless, great applause to Coach Nuttall and the boys for never giving up, demonstrating great work ethic, and their effort would make Sergio proud. The ladies played on Sunday after a routine win against perinniel power UConn. A quick goal gave them a 1-0 lead that was never relinquished. The game against BC in the round of 32 was much closer than the 5-0 opening day loss. The ladies proved much tougher this time out going down to a 3-1 defeat. The ladies finished 19-3 and we at the foundation are proud to share in their success as 3 scholarship winners (Tiffany Yovino, Brittany Butts, and Nikki Choeffel) played major roles in the success. The Men’s team play in the CAA tournament this weekend and while their task is not easy, two wins will allow them to qualify for the College Cup. The boys have played brilliantly down the stretch, going 4-0-2, to move from 11th place to a 3rd place finish in Conference play. Good luck to Coach Nuttall and the boys. When we first endowed the Sergio Villanueva Scholarship at Hofstra University, we knew that we would have an impact on the lives of many young men and women. We hoped that these young men and women would exhibit the work ethic and dedication that was a hallmark of Sergio’s life. 2008 scholarship recipient Tiffany Yovino, as well as the whole Hofstra Women’s Soccer team, has exceeded our expectations this year. 17 straight wins, a regular season conference championship, and a national ranking of 17th in the country only tell part of the story. This group of young women, most from our area, have heard me talk the past 4 years on a variety of subjects including this years theme of overcoming hardships. The 2010 Womens Team has not faced many obstacles in 2010 but when challenged, they have stepped up. Tiffany, while only 5 ft tall, has stood tall, and was named CAA player of the year for her outstanding play. Coach Riddiough was honored with CAA coach of the year. The ladies know their season will not be complete without an NCAA tourney bid and hopefully a long run in the tournament. While a bid is not guaranteed, it would be hard to deny the women a bid this year. A conference championship this weekend might give them the opportunity to even host first and second round games. CAA tournament play starts today at 4;30 with JMU vs George Mason, followed by Hofstra playing Georgia State at 7. Winners will meet Sunday at noon. All games played at Hofstra University Soccer Stadium. While the Hofstra University Women’s Soccer Team has enjoyed unparalled success this year (more about that in a post later this week), The Men’s Team has struggled at times to find an identity. With Coach Nuttall trying to blend youth and experience the Pride had remained down in the lower depths of the CAA Conference standings. While their back line remained solid, goals were hard to come by for Hofstra. With half the conference season over, the Hofstra Pride found themselves in 11th place. It would have been very easy for this young team to have thrown in the towel, gone through the motions and gotten ready for next year. Coach Nuttall would not allow this to happen. That is how I found myself standing in front of approximately 20 young men in the visiting locker room at George Mason Stadium. The boys had forged a 3 game unbeaten streak that had vaulted them from 11th place to a 5th Place tie with 3 games left and only the top 4 teams qualifying for the conference tournament. Over the past 8 years, Coach Nuttall has allowed me to address the team during pre-season. These talks focus on Sergio and his dedication as well as a life lesson. While I had addressed the women’s team earlier in the year, scheduling troubles had delayed my talk to the men’s team until last Wednesday night. This year’s talk focused on trust and how Sergio and his fellow firefighters had trusted each other on 9/11 and throughout the years. Being part of a team must include trusting your brothers and giving maximum effort even when things look bleak. Trust was an important element as the members of the New York City Fire Department entered the WTC on 9/11. Trust was the calming factor as these brave men and women climbed countless stairs to thier untimely death. I hoped that the team would understand a little bit of what I tried to teach that night and it was soon evident that they did. A George Mason goal mid way through the first half would give the Hofstra team an opportunity to question their trust, but that was not the case. Their second half effort was relentless and an equalizer would come in the latter stages. Their hard work was further rewarded with a goal in the second overtime vaulting the Hofstra Pride to a 2-1 win and into 2nd Place in the CAA. A home 0-0 draw with the 17th ranked Tribe of William and Mary College allows the Pride to control their own CAA playoff hopes with a win next Saturday at James Madison. I am confident that if the boys continue to trust each other and play with maximum effort, that they will secure a playoff spot.